It's only fitting that Bryce Brentz's fourth-inning home run sparked his team to a comeback win. After all, he was playing in his first game after coming back from a knee injury that reportedly was going to sideline him for the rest of the season. The Red Sox's No. 9 prospect hurt his right knee sliding into second base on July 5 at Rochester. He was placed on the disabled list three days later and underwent surgery to repair a torn meniscus on July 16. After six games in the Rookie-level Gulf Coast League, Brentz returned to Triple-A and slugged a two-run shot that helped Pawtucket rally for a 6-5 victory over visiting Scranton/Wilkes-Barre. Recovery time from the surgery is typically six weeks, which would have forced Brentz to miss the end of the International League season. "After surgery, they told me the timeline for some people is less, that some people come back earlier," he said. "My whole goal ever since I heard that was to be one of those people, to come back early and not have a setback or anything. "I started playing my first game 4 1/2 weeks after surgery. I was in there DHing and I was testing the knee out every way I could. I tried to push it. It felt good, so I kept going. Closer to the surgery, there were some days when it didn't feel so good, but I still did everything I did. I pushed it to see what the limit was." Brentz said his work with the Red Sox training staff in Florida enabled him to focus on the muscles that would help him heal fastest. "They said you really need to build up your quad strength, so I tested it as much as I could. I never had any setbacks, so I just kept pushing it," he added. "Every day, I would wake up and think, 'Is this going to be the day when it hurts a little to walk?' Fortunately, though, it never did." 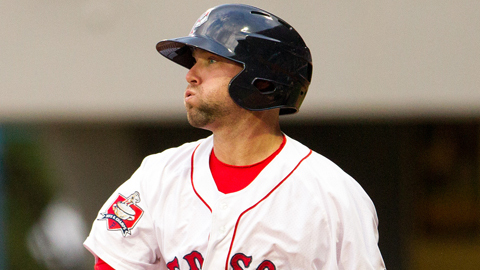 The six games he played in the GCL also were instrumental in getting him ready for his return to Pawtucket. "Doing the rehab stint, there were little things that happened a lot that helped me build up confidence," the 2010 first-round pick said. "In one of my first games, there was a catcher who was popping over to first and I had to rush to get back, stuff like that. And all the running stuff I had to do, scoring from second, it all gave me confidence. I felt healthy and I wanted to come back as soon as I knew I wasn't going to handicap the team." The 24-year-old outfielder proved an immediate asset, hammering a 2-2 offering from RailRiders starter Chase Whitley over the center-field wall for his 17th International League homer and first since July 2. "He did a good job of keeping us off-balance," Brentz said of the right-hander. "He was testing me with a fastball on 2-2. It's one of those counts where you just sit there and try to protect. I read the fastball out of his hand early enough and I got a pretty good swing on it." The blast got the PawSox within 5-3. "It made it a really special day," he said. "Early in the game, it didn't look good for us, but this team battled, just like this team has battled all year." Brentz also had a chance to test his knee in the top of the first as two RailRiders doubled to right off No. 6 Red Sox prospect Anthony Ranaudo. "That's definitely baseball -- the ball will find you," he said. "It happened in Florida, too. I had a couple doubles I had to chase down right away. Just like then, I felt fine getting to them. Everything felt good." Brentz also walked in the fifth ahead of Jonathan Diaz's two-run double that forged a 5-5 tie. Brock Holt led off the bottom of the seventh with his third homer of the season to put Pawtucket in front. Ranaudo gave up five runs on eight hits over three-plus innings, but Chris Martin (3-3) tossed two scoreless frames for the win. Anthony Carter pitched around a walk in the ninth for his 22nd save as the PawSox moved 2 1/2 games ahead of second-place Rochester in the IL North Division.